A series of ten terrorist attacks that occurred across Mumbai, India's financial capital and largest city, on 26 November 2008. The main targets of the attack appeared to be Americans, Britons and Jews, but most of the casualties were locals and foreign tourists caught in the gunfire. At least 125 people including at least six foreign nationals have been confirmed dead, and at least 327 have been injured. All except one of the attacks took place in South Mumbai; at the crowded Chhatrapati Shivaji Terminus (CST) railway station; at two five-star hotels: the Oberoi Trident at Nariman Point, and Taj Mahal Palace & Tower near the Gateway of India; at the Leopold Café, a popular tourist restaurant in Colaba; at the Cama Hospital; and at the police headquarters where at least three high-level officers, including chief of the Anti Terrorism Squad of Maharashtra, were killed by gunfire. Between fifty and sixty terrorists have been involved in the attacks. A previously unknown organization identifying itself as the Deccan Mujahideen claimed responsibility by email sent to news organizations. Due to the apparent targeting of Britons, Americans, and Jews, the number of militants involved, the amount of equipment they used, and the pattern of co-ordinated attacks, several reporters and media analysts speculate that non-Indian Islamic terrorists may have been responsible. Prime Minister Manmohan Singh has said the attacks probably had “external linkages,” believing that the attack could not have occurred without help. The Indian Mujahideen terrorist group threatened in September 2008 to carry out bombings on sites in Mumbai.According to some news reports, a terrorist holding hostages at the Oberoi told an Indian TV channel that they wanted all 'Mujahideen' in Indian prisons released before they released their hostages. He also indicated that there were seven terrorists holding hostages at that location.Other reports indicate that this demand was made through a hostage at Nariman House, in a call to the Israeli consulate in New Delhi. At least 125 people have been killed in the attacks and 327 wounded.Seven Britons, three Americans, two Australians, and two Canadians were among those injured.Among the dead are 81 Indian civilians, 14 policemen and six foreigners, including one Japanese, one Australian, one Briton, one Canadian, one Italian, and one German.In addition, nine terrorists were killed and nine more were arrested. According to British High Commissioner in India, Sir Richard Stagg, seven Britons have been injured in the terror strikes and one dead.Andreas Liveras, a British yachting tycoon, was among those confirmed killed.Eleven other foreigners of different nationalities were injured in the terror strikes and were admitted to the Bombay Hospital. Hospital sources said the injured foreigners are from Australia, USA, Norway, Spain, Canada and Singapore.However, Singapore's Ministry of Foreign Affairs maintains that no Singaporean has been injured in the attacks.Three Americans and two Australians are reported amongst the injured. Mumbai Anti-Terrorism Squad Chief Hemant Karkare,who headed the team investigating the politically sensitive 2006 Malegaon blasts. Karkare had also been receiving death threats recently,including a threat to bomb his residence,but it is unclear if these were related to his death. Senior inspector Shashank Shinde,who had recently been involved in investigating many of India's recent bombings. 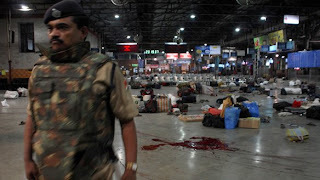 Three railway officials of Chhatrapati Shivaji Terminus also have been killed in the terror strikes. The Government of Maharashtra announced Rs. 5 lakh (about 10,000 USD) compensation to the kin of those killed in the terror attacks and Rs. 50,000 (about 1,000 USD) to the seriously injured. At least one media source (Press Trust of India, posted to NDTV.com) was reporting a death toll of more than 280 as of 27 November.